Life is made up of seemingly endless decisions. We face decisions every day of our lives – some are as minor as what to wear or what to eat, while others may be huge, impacting our lives or the lives of hundreds or even millions of others. As Christians it is crucial that we understand Biblical principles on how to make decisions that will honor and glorify God. It is to this subject that the book Decisions, Decisions is dedicated. To begin the discussion he examines revelation and shows how God’s revelation to us is sufficient and complete in the Scripture. To seek God’s will in certain ways, such as through signs and wonders, is futile, for God no longer operates in such ways. Similarly, to put our faith in random verses of the Bible or flips of a coin are to deny our responsibility to make decisions on our own. 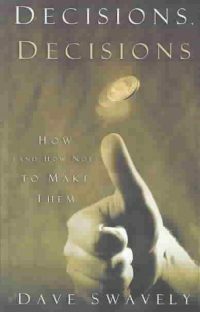 After several chapters outlining how not to make decisions, all of them based on things you have heard from Christian friends or may have said yourself, he turns to an examination of the Biblical principles of making godly decisions. He first examines the prerequisites of making Biblical decisions. These are walking in the Spirit, recognizing God’s sovereignty and praying for wisdom and providence. Without these prerequisites we cannot expect to be able to make godly decisions. When these prerequisites are in place he outlines four aspects of decision-making. The first key to making Biblical decisions is Scripture. Scripture rules supreme over any of the other principles. The Bible bears on every decision we make, either directly or indirectly. For example, any decision relies on motive, and the Bible has much to say about motives. Also, the other three principles of decision-making are drawn from the Bible. While the Bible does not describe exactly what to do in any given situation, it does tell us everything was absolutely need to know in order to make a proper decision. Scripture points us in the direction of the right decision, even if it does not tell us exactly what we must do. At this point the author teaches that provided an option is not absolutely forbidden by Scripture, we would not sin by taking that option. We are given freedom in Christ to decide whether or not to proceed. So we may now be faced with two decisions: first, should we or should we not do it and second which of the options should we take. The second key to making Biblical decisions is wisdom. He defines wisdom as “a knowledge of Scripture and the ability to apply that knowledge in your life.” Wisdom is tied to Scripture since Scripture is the source of God’s wisdom to us. The words are often used interchangeably in the Bible. The third key is desire. If we are living by the Spirit and immersing ourselves in the Word of God, we see that God will plant desires in our hearts. It is good and proper, then, to do what we desire. The fourth key is counsel. The counsel of other believers who meet the prerequisites of Biblical decision-making should play a part in each of the other aspects. Other believers can share their knowledge of Scripture, can share their godly wisdom and can interpret our desire. These four principles, each backed with ample Scriptural support, provide the author’s framework for making Biblical decisions. He presents his case well and his words are convicting. As one who has often struggled in this area, I highly recommend this book.